Good Monday morning. Look for President Trump to be on the field, or otherwise highlighted (advance folks were hashing out details), during the National Anthem at tonight's college football championship in Atlanta (Alabama v. Georgia; 8 p.m. on ESPN). This will be a kneel-free zone: College players stay in the locker room during the National Anthem. ESPN wanted to interview Trump, but say that looks unlikely: "We’re still taking to the White House. I don’t get the sense he’s going to do an interview." While she told Bloomberg after her speech that she had no plans to run, her partner, Stedman Graham, told the L.A. Times that "she would absolutely do it." 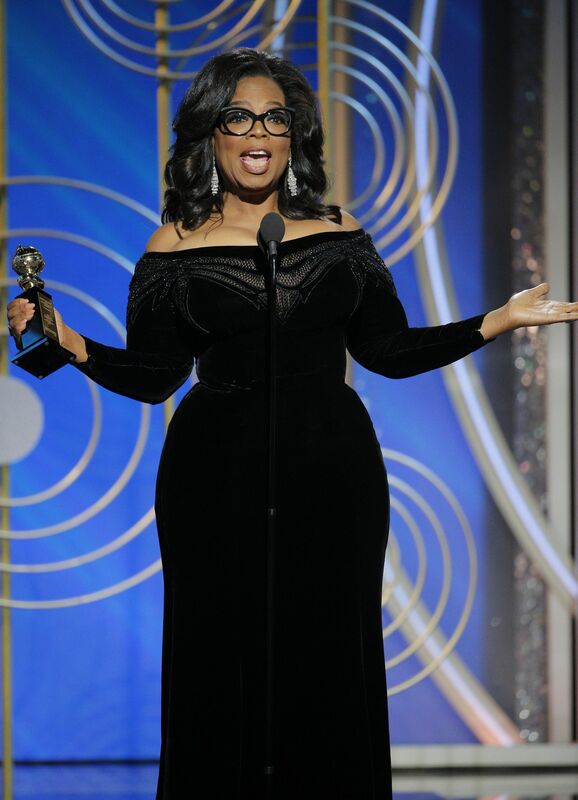 Why it matters: Oprah hits all the right notes at just the right time for a media obsession. She’s not a white man, she’s liberal, she’s flirted with the notion of running, she’s a voice for women and the abused in a sullied Hollywood industry, she’s famous. She’s the anti-Trump, which helps explain this morning's over-the-top political speculation about a nine-minute speech." "In 1964, I was a little girl sitting on the linoleum floor of my mother's house in Milwaukee watching Anne Bancroft present the Oscar for best actor at the 36th Academy Awards. She opened the envelope and said five words that literally made history: 'The winner is Sidney Poitier.' Up to the stage came the most elegant man I ever remembered. His tie was white, his skin was black—and he was being celebrated. 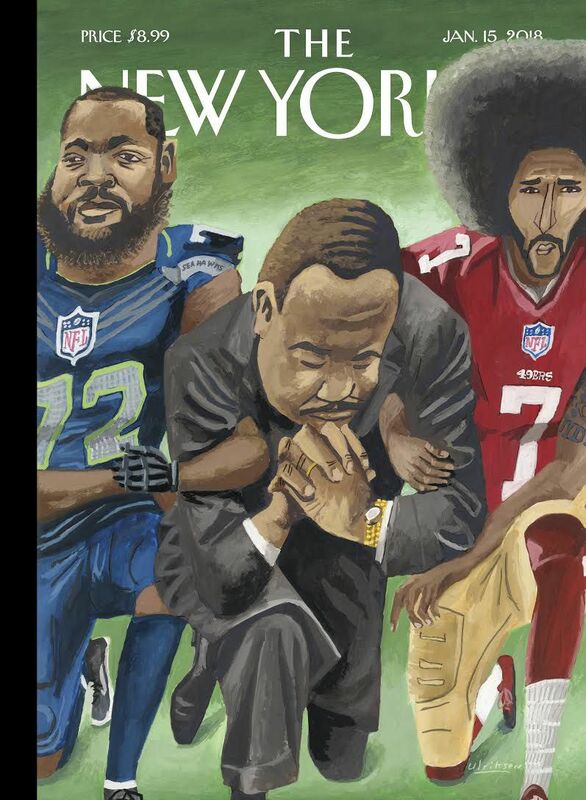 I'd never seen a black man being celebrated like that." President Trump plans to visit the concrete-and-steel prototypes of his beloved border wall in San Diego after his State of the Union address on Jan. 30, sources tell us. At a time when Trump could be waffling on his signature commitment — perhaps shifting the conversation to border enforcement in an effort to get a deal with Democrats — he plans to solidify his insistence on the actual physical wall, the sources said. 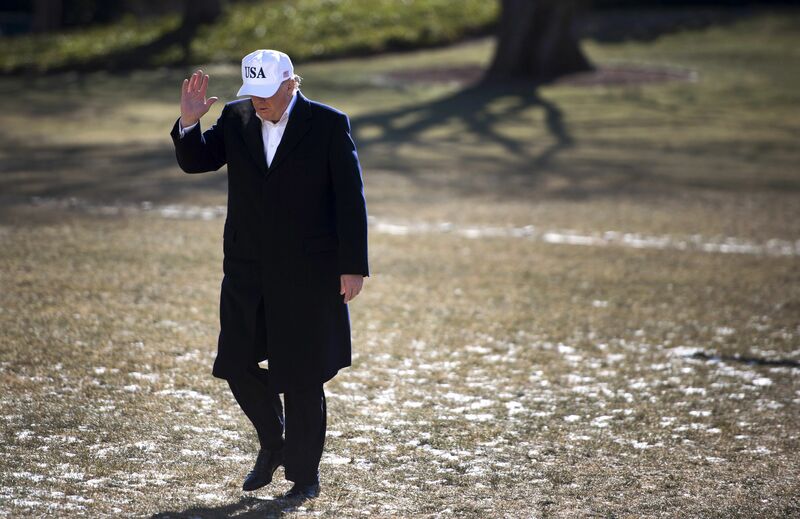 Aides say Trump has been unequivocal for months: "Wall, or no deal." The field trip to see the prototypes had been planned for this week, but was pushed back after Trump decided to attend tonight's college football championship. Administration officials see a possible deal with Dems because terrain doesn't allow wall construction in some places, and the wall could help with drug interdiction as well as curtailing border crossings. Why it matters: Trump insiders say that as they think about 2020, no promise is more vital in Trump Country. He can't blame Democrats for the fact that there's not a wall — he has to find a way to deliver one. It was such a central and symbolic promise that there's no averting your gaze from it. A source close to Trump said: "The wall is bigger than a policy proposal — it’s a symbol. Ending chain migration may be more impactful policy, but he understands the power of the wall as a concept and in terms of the way he and his presidency will be perceived and judged." Be smart: As the White House looks to this year's midterms and reelection in 2020, and as more moderate advisers depart, look for President Trump to sound more like Campaign Trump on immigration, trade and other issues. "Trump’s legal team is seeking clarification on whether the president would be interviewed directly by Mueller, as well as the legal standard for when a president can be interviewed, the location of a possible interview, the topics and the duration. But the president’s team is also seeking potential compromises that could avoid an interview altogether." Pope Francis presides over a Mass in the Sistine Chapel at the Vatican yesterday, baptizing 34 cooing and crying babies and encouraging their parents to make sure the "language of love" is spoken at home. 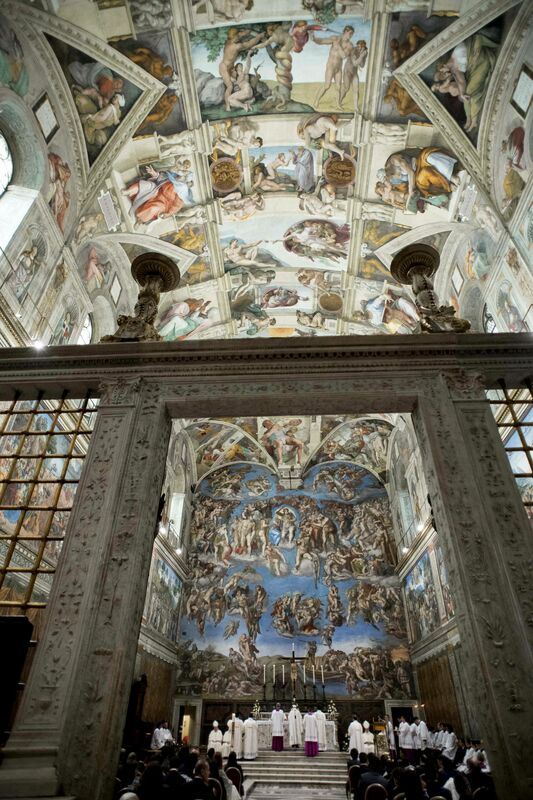 With Michelangelo's famed frescoes on the ceiling overhead, the parents, some with other young children in tow, brought 18 girls and 16 boys forward to Francis in the annual ceremony. An eye-opening New Yorker piece that lawmakers and administration officials should soak in, about "a major legal battle over the U.S. government’s duty to protect prospective deportees who plead for their lives." "In the past decade, a growing number of immigrants fearing for their safety have come to the U.S., only to be sent back to their home countries — with the help of border agents, immigration judges, politicians, and U.S. voters — to violent deaths." "Often, immigrants or their families had warned U.S. officials that they were in danger if sent back. ... [M]inor missteps — a traffic violation or a workplace dispute — can turn lethal for unauthorized immigrants." CNN"s Brian Stelter: "The tiptoeing is over. The whispers are turning into shouts. President Trump's fitness for office is now the top story in the country. That's partly due to Trump's behavior... partly due to Wolff's book... partly due to Trump's reaction to the book." "Two things stand out about the foreign policy messages Mr. Trump has posted on Twitter since taking office: How far they veer from the traditional ways American presidents express themselves, let alone handle diplomacy." "And how rarely Mr. Trump has followed through on his words. Indeed, nearly a year after he entered the White House, the rest of the world is trying to figure out whether Mr. Trump is more mouth than fist, more paper tiger than the real thing." "Democrats are hoping to winnow down the options during the 2018 campaign season, providing clarity for their 2020 presidential candidate. In polls, health care remains a top priority for the public, particularly for Democrats and independents." Why it matters: "Rising Democratic ambitions come as a cloud of uncertainty lingers over former President Barack Obama's health law. ... Congress has ended the health law's requirement that most people get coverage, and that's expected to lead to higher premiums in 2019. 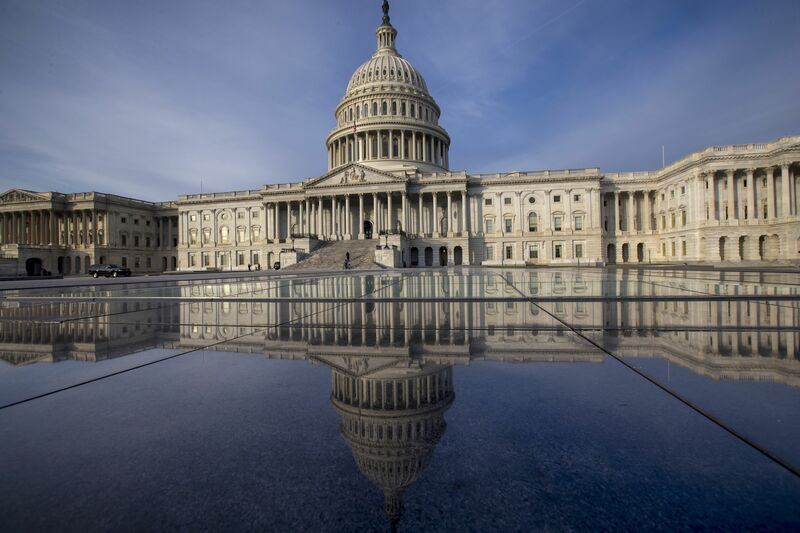 But bipartisan legislation to stabilize insurance markets doesn't seem to be getting traction." "Much like surfing, it's not easy and won't last forever." "Getting political support is the easier part right now in Washington. President Trump is making natural-gas exports a cornerstone of his energy agenda and his default environmental policy because the fuel is cleaner than coal and oil." "Jana Partners LLC and the California State Teachers’ Retirement System, or Calstrs, which control about $2 billion of Apple shares, sent a letter to Apple on Saturday urging it to develop new software tools that would help parents control and limit phone use more easily and to study the impact of overuse on mental health." "Sting and his wife, Trudie Styler, will be on an advisory board along with Sister Patricia A. Daly, a nun who successfully fought Exxon Mobil Corp. over environmental disclosures, and Robert Eccles, an expert on sustainable investing." Why it matters: "Obsessive teenage smartphone usage has sparked a debate among academics, parents and even the people who helped create the iPhone." Be smart: Addiction questions that have been rising about Facebook are now extending to device-makers — a new front in this season of confrontation for Big Tech. “This is 49er country, and my mom and I have been going back and forth —she’s upset that players have brought politics into sports, but I say, How would you feel if you had to show up at work every day and salute a country that treats black people like second-class citizens?" "The procession of black dresses that began at the Beverly Hilton’s red carpet moved to the winner’s podium as films and television shows driven by women — 'Lady Bird,' 'Three Billboards Outside Ebbing, Missouri,' 'The Handmaid’s Tale,' 'Big Little Lies' and 'The Marvelous Mrs. Maisel' — prevailed at a ceremony marked mostly by serious speeches focusing on months of allegations and admissions of sexual harassment within Hollywood." "The evening, long marketed as the looser, less inhibited answer to the stodgy Oscars, actually felt a lot like the Academy Awards with plenty of effusive and heartfelt acceptance speeches."